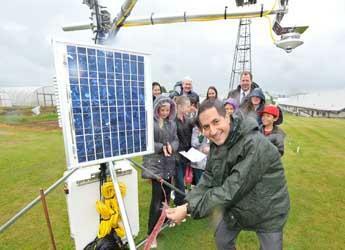 BBC weatherman Stav Danaos officially opened the automatic weather station at the James Hutton Institute in Dundee on a rainy June day. James Hutton Institute meteorological observers Dr Roy Neilson and Alison Dobson look back at the weather statistics gathered at the Dundee site to reveal just how wet 2012 was. The enduring images of 2012 were of severe floods devastating homes and huge tracts of agricultural land under water resulting in delayed harvests. It seemed like it never stopped raining but was that a true representation of the 2012 weather? The James Hutton Institute in Dundee has one of the longest running agricultural meteorology databases in the UK, dating back to 1954; providing us with an opportunity to look back to determine whether 2012 was indeed a record weather year. The beginning of 2012 held promise for a glorious year. Due to the combination of a blocking anticyclone diverting low pressure systems away from Scotland and an unusually northern location of the Atlantic jet stream, the period from January to March 2012 was the third driest since our records began. Only 59.4 mm rainfall was recorded representing 35% of the 30 year (1981-2010) long-term average. March 2012 not only the driest March on record at the James Hutton Institute but also the equal fourth driest month we have recorded (Table 1). Table 1: Lowest monthly rainfall totals recorded at the James Hutton Institute, Dundee (1954-2012). Unfortunately that is where the good news ends. With brief respites in September and November; both months having below average rainfall totals; the remaining seven months of the year each had above average rainfall totals ranging from 132% (October) to 248% (June) of the 30 year long term average. We recorded the wettest June, second wettest December, third wettest April and fifth wettest August since our records began in 1954. Furthermore, 2012 had two of the six wettest days ever recorded (measured from 0900-0900) on our records (Table 2). Table 2: Highest daily (measured 0900-0900) rainfall totals recorded at the James Hutton Institute, Dundee (1954-2012). As a result 2012 was the third wettest year since our records began with a total of 931.3 mm rainfall representing 129% of the 30 year average with only 2002 (979.8 mm) and 1998 (945.7 mm) being wetter. Recent debate in the media regarding annual rainfall totals has centred on potential changing rainfall patterns both in terms of amount and timing in the context of climate change. Interrogation of our 58 year meteorological database has uncovered some interesting patterns. The UK Meteorological Office uses a rolling 30 year period to calculate long-term averages as a comparator against current weather. We are able to calculate three such 30 year periods from our database which indicates an increase in average annual rainfall of 32.1 mm over a 50 year period (Table 3). Of course caution should be exercised as in meteorological terms this period is relatively short. Table 3: Average annual rainfall totals for three 30 year periods at the James Hutton Institute, Dundee. Furthermore it has been suggested that rainfall during the summer months has increased in the last 20 years. Our data would suggest that since 2000, August has had significantly higher rainfall totals compared to the long-term average (Figure 1). Figure 1: Average monthly rainfall totals for June-August calculated for three time periods: 1981-2010 (30 year long term average), 1990-2012 and 2000-2012based on data recorded at the James Hutton Institute, Dundee. Error bars represent standard error of the mean. Given that 2012 was so wet, it may be surprising to many that we had a close to average year of sunshine with 1363 hours of sunshine (95% of the 30 year average). Notwithstanding that a sunny March and September effectively compensated for the dullest June-July period since our records began but it may also hint that either much of the rainfall occurred overnight or potentially the rainfall was more intense. As our rainfall records are manually recorded and represent amounts that fall within a 24 hour period it is not possible for us to answer these suggestions directly. As we move forward, this will be addressed when our new automatic weather station, which has been undergoing extensive testing and will come online later in 2013. However analysing data for rain days; i.e. a 24 hour period where a threshold level of rainfall is reached; clearly indicates that there were significantly more rain days both ≥ 1 mm and 5 mm rainfall during the period April-August and December 2012 compared with the 30 year long-term average (Figure 2). Figure 2: Number of recorded rain days (≥ 1 mm, dashed line; ≥ 5 mm, solid line) during 2012 (solid square symbol) compared with the 30 year (1981-2010) long-term average (solid triangle symbol). Error bars represent standard error of the mean. It is therefore likely that the excessive number of rain days during the period April-August 2012, especially those ≥ 5 mm was a major contributory factor to the saturated soils resulting in much of the flooding experienced in the local area.